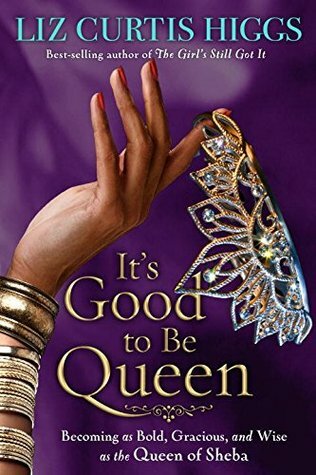 To Everything There Is A Season: It's Good to Be Queen Review-Worth the Read! Sheba Journeyed Across the Desert with a Caravan of Riches, Only to Find the Greatest Treasure of Them All. So Can You. I love Liz Curtis Higgs' writing. She is so talented at creating a story line or in this case explaining a story line. I have read this passage in the Bible multiple times but I always read it and just take it for granted. As if it was totally normal for a woman to travel so far with tons of people and camels and gold and jewels and spices. As if it's no big deal as to why this whole story is even in the Bible -it's obviously in there for a reason. I think Liz Curtis Higgs does a great job at not only reading the passage and explaining the history, but also how the Queen of Sheba is an example to women. I like that she sticks to what the Bible does say and not what others have assumed. I like that the entire passage in I Kings is broken down almost word by word so that it actually makes sense.